The SensatioNail Express Gel formula is new to me. I've never tried these at-home gel kits with the lamps, but I always wanted to try them. Because I always do my nails at home. Sitting in a nail salon is not my thing. My first and last nail appointment was before my wedding 12 years ago. Don't get me wrong, my nails were gorgeous and better than I could ever do them myself. But it hurt. It took forever. And it just wasn't for me. If my nails don't look professionally done, I'm okay with that. Maybe that's also down to me being a chronic nail biter for over twenty years and finally (most of the time) kicking that habit and I actually HAVE NAILS NOW. I just enjoy painting them myself and being able to change the color whenever I like (because I'm so freakin' indecisive in this department). And now we can get fancy gel nails at home? Count me the heck in. I was sent the Complete Manicure Kit in Red Your Profile, as well as two Express Gel polishes in Made Him Blush and Not My Nana's Pearls. If you've interested in seeing these shades and hearing what I think about the collection, just keep reading! I love working with this specific PR company for many reasons and one is because they send me the cutest packaging ever. They put so much thought into it! 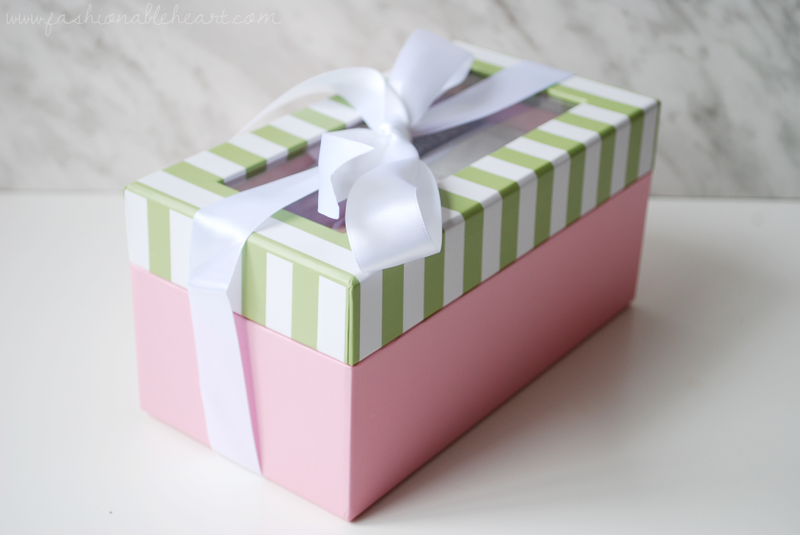 How adorable is this bow box? I'm saving it to reuse, because how can you not?! The kit comes with one gel polish, in this instance it is Red Your Profile. You also get a manicure stick, nail buffer, and the LED lamp needed to cure the polish. When buying just the polish, that is all that comes in the box along with a sheet of instructions. It's actually quite a bit of packaging for a bottle of polish. The nail polishes are 10mL. The kit is easy to understand and use. The lamp is compact and hooks up with a simple cord and is ready to go instantly. I read a few people say that the lamp wasn't curing their polish and it turned out they were taking their nails out after the 15 second warning flash and not the full thirty seconds. That's literally the time it takes- 30 seconds! Well, a minute if you're me because I just like to feel reassured. All in all, I'd say doing my entire manicure takes around five minutes when two coats of the polish are involved. So yes, it's pretty instantaneous! The formula promises days without chipping and unfortunately that is where the first con of the product comes in for me. I've tried this kit on several different occasions and each time I've seen chips on either the first or second day. Sometimes an entire nail's worth of polish just peels right off. So if you're wanting to do these before a long vacation and not worry about your nails, I don't see this being a good fit. However, if you have a one-day event or outing, this is a perfect quick solution. Maybe the easy removal is a good thing if you are like me and enjoy changing your nails constantly and don't want to always wreak havoc with the typical gel removal process. But yeah, I do not experience a lasting manicure with any of the three shades I have. For the shades, Made Him Blush is my favorite. Not just the color, but the application. It goes on smoothly and has a nice shine to it. As a southern girl, I love the name of Not My Nana's Pearls. We love us some pearls! It goes on fine and is just a true white. I like it, I'm just one to always want white on my nails. And then, there is Red Your Profile. It is my least favorite. The color is pretty enough, but my bottle of it is clumpy and hard to smooth out for an even application. It also is the easiest to peel right off the nail. I really enjoy using the kit and the polishes. I know the con I mentioned is a big one and possibly a deal breaker for some of you, but I still love the quick timing and the finished result. If I have an event or errands to run and don't have the time to spend on a regular manicure, taking five or so minutes to get one is a lifesaver. The kit retails around the $50-60 CA range while the nail polishes center around $11-13 CA. There are other shades available like Mauve It or Lose It, Royal Pain in the..., and Cafe Au Lait Au Lait Au Lait. 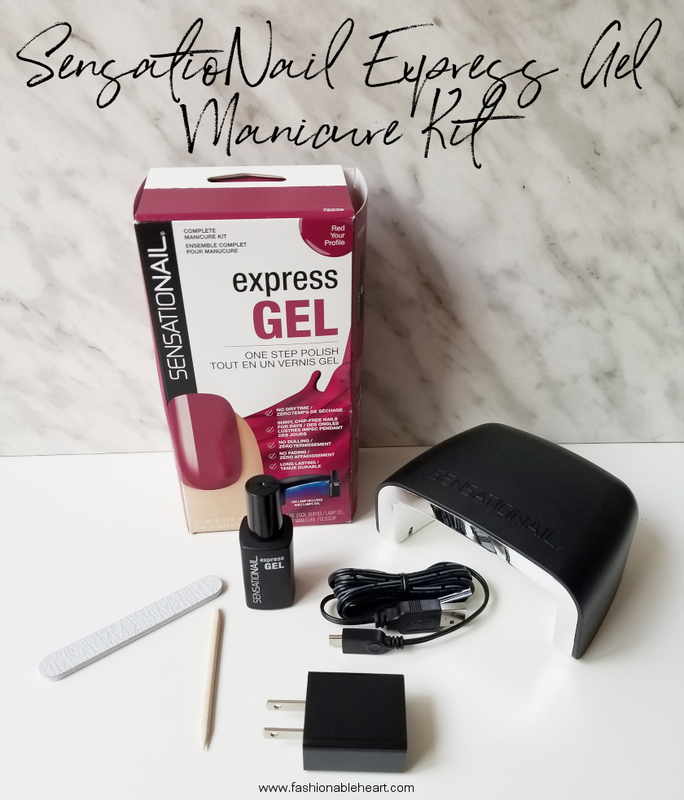 What differentiates the express from the regular SensatioNail kit? It's a one-step polish, erasing the need for a base and top coat or primer. I think the original process might last longer because of those things and I'll have to get my hands on the primer and base/top coat to find out and compare! While this didn't wow me in lasting for days as advertised, it did wet my whistle on at-home gel kits. I approve of the fast results, high shine finish, and the ease of application. Made Him Blush is on the left. Both Red Your Profile and Not My Nana's Pearls are in this Canada Day manicure. If you're in Canada, you can still get your hands on a set of these Maple Leaf nail vinyls for free by using my code. Just throwing that reminder out there! 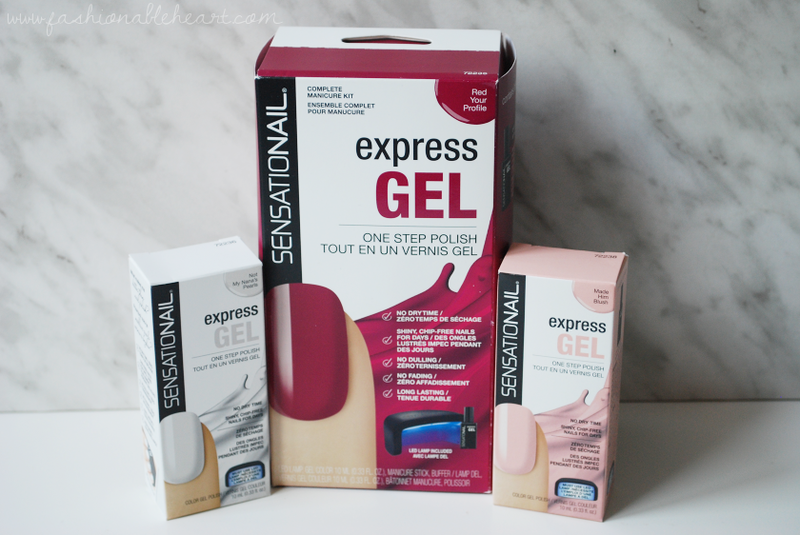 So what do you think of the Express Gel system? Have you tried either the standard formula or the express version? I'd love to hear what you think. ** I received the SensatioNail manicure kit and polishes for testing and reviewing purposes. All thoughts and photos are my own. There are no affiliate links in this post.